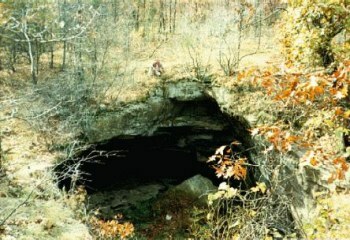 The karst of the Missouri Ozarks is almost textbook, and is characterized by well eroded rolling hills, deep hollows, springs, caves, sinkholes, losing streams, natural bridges, and tunnels. There are four things which make the Ozarks uniquely vulnerable to form karst. We have a regional dip of one to three degrees. This means the sedimentary layers are slightly tilted, not flat-lying. Since water runs downhill, this dip encourages groundwater movement. Secondly, our basement rock consists of buried igneous mountains. This means the best route for water underground may not be a straight line, as these igneous rocks do not erode easily. Thirdly, the area is moderately seismically active. Earthquake stresses jostle the rocks without causing them to collapse, which opens new possibilities for the water to flow. And last, our rock layers are not typically 'tight'-- we have entire zones which are less compacted due to fossils, unconformities, chert, clay and mineralized areas. While this makes poor building stone, it makes excellent karst. Once beneath the surface, the groundwater is unevenly distributed through the karst bedrock. This "reservoir theory" accounts for the varying levels of spring flow, which are related to rainfall, but not necessarily on an immediate basis. Tom Aley, a well-known hydrologist, divides spring flow into base flow and surge flow. Base flow is that which is more or less constant, and is stored in deep levels, whereas surge flow is that which more immediately related to local rainfall. Because the water is contained in varying conduits such as tubes, caves, cracks, joints and these are interconnected at varying elevations, the sources of groundwater for a spring may vary depending upon the amount of water already in the system, the level of the outlet, and the amount of water entering. Aley illustrates this state of affairs with his "milk-jug" theory of spring flow--by placing milk jugs with varying amounts of water in them, and interconnecting pipes at random levels, he demonstrates that adding more water to the system will cause varying results based on many variables. The water "table" in southern Missouri is much more like a pockmarked and tunnelled minefield than anyone's table. Some of the most beautiful sites in Missouri are a result of karst processes, as are some of our most pressing land use problems. Since the undeveloped land seemed to have managed very well, it is up to people to use some sense when they go to develop it, and take its unusual character into account.